Looking for a Cape Town Beach with Blue Flag Status? Are you looking for an award winning Cape Town beach? 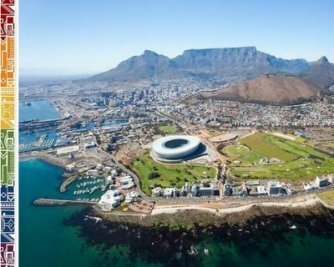 Cape Town has not only plenty of beautiful beaches, but also some of the cleanest beaches in the world with the highest standard facilities so the whole family can enjoy a day out. Amazing Muizenberg beach is one of them! Did you know that Cape Town has ten great Blue Flag beaches? If you think this is a quite small number regarding the many wonderful beaches here, we can tell you that it is really a big challenge to obtain the prestigious Blue Flag Award, an eco label by the Danish organisation 'Foundation for Environmental Education'. These blue flag beaches are coming highly recommended by a well trusted foundation and the Capetonians can be really proud of this. Well done! The Blue Flag is an eco label awarded to the best beaches worldwide. The beaches are tested by an independent committee (read more below) if they adhere to an international set of criteria. In 2018, there are ten South African blue flag beaches and three blue flag marinas located in and around Cape Town. Below you will read which Cape Town beaches and marinas have received Blue Flag Award status. Five of these great Cape Town beaches are located at the Atlantic Ocean and five of them are situated on the much warmer Indian Ocean coastline. •	Muizenberg Beach at the Indian Ocean in False Bay which you have seen on top of this page is very popular with families and surfers as there is a wide long beach with shallow water, which makes for safe swimming and the water feels much warmer than at the cold Atlantic. This Cape Town beach offers lots of space for fun and games and great waves for those body surfers who have a great time at the further end of the beach. There are many surf schools and surf shops in the area and entertainment is provided for people of every age. There is a water park with giant slide, a mini-golf park, play park for the children, shops and restaurants close by. There are changing rooms as well as clean toilet facilities and enough safe parking. At the weekends there is a huge open-air flea market in the parking area close to the beach. Read more. •	Fish Hoek Beach at the Indian Ocean in False Bay with its long sandy beach, and shark spotters along the bay. A variety of amenities is nearby and this is one of the most popular beaches along the False Bay coastline. •	Strandfontein Beach at the Indian Ocean in False Bay with the biggest tidal pool south of the Equator, which makes for safe swimming. And lifeguards are on duty at this popular beach too. Great place to go whale-spotting. •	Mnandi Beach: This Cape Town beach first received Blue Flag status in 2004 and has kept this award since. This place is very popular with the residents of nearby Khayelitsa, Mitchell’s Plain and Strandfontein as it is located near Strandfontein. There are good facilities as well as a giant waterslide and pool with picnic area. Safe parking available too. •	Bikini Beach: This beach near Somerset West has Blue Flag beach since 2005. It is situated roughly 45 minutes to the East of Cape Town’s City Center in Gordon’s Bay. It is protected from the strong wind which often blows along Gordon’s Bays Main Beach and Harbour front and so offers great swimming and sunbathing conditions. •	False Bay Yacht Club was award blue flag status for its marina in 2012. •	Harbour Island Marina was award blue flag status for its marina in 2014. •	Camps Bay Beach: Sheltered half-moon shaped bay with splendid backdrop of the Twelve Apostles Mountain range. Great family beach with beach vendors selling ice-lollies and drinks and recently a deck chair and umbrella rental station. This is one of the Capetonians' and tourists' favorite CapeTown beaches. The bars and restaurants at the palm-tree lined beach promenade are a popular place to take a sundowner or just relax after a couple of hours of sunbathing. •	Clifton’s 4th Beach: Blue Flag status since 2004. Protected against Southerly winds this one of Cifton’s four beaches is very popular with Capetonian families. It is still quite small compared to many other CapeTown beaches but has got a great vibe and is the beach for a proper beach party. This Cape Town Beach is a must for sunset lovers too. Take a picnic and enjoy your sundowners. At Clifton 4th you can rent deck chairs and umbrellas and there are bars and vendors selling drinks and ice-cream too. This beach offers clean changing rooms and toilet facilities. Lifeguards are stationed there too. Lots of people enjoy life at this Cape Town beach at the weekends, so be prepared to arrive early or you might have trouble finding parking along Victoria Road and have to walk far. Expat Cape Town Advice: There are narrow stairs to walk down to the beach, so unfortunately no access for wheelchairs or pushchairs. 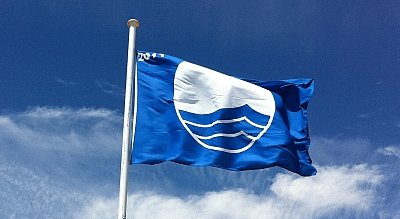 •	Llandudno: This scenic spot which had achieved Blue Flag status for the first time in the summer season 2011/2012 is listed with full Blue Flag status again since 2017. Situated between Bakoven/Camps Bay and Hout Bay this is a nice half-moon crescent shaped beach in a very safe neighborhood. Llandudno beach is one of the top three Cape Town beaches for water quality. •	Melkbosstrand at the Atlantic Ocean has a long stretch of white powdery sand and lots of facilities from coffee shops to doctors offices, everything is nearby. It is especially popular with many residents from the northern suburbs. •	Silwerstroom Beach: awarded Blue Flag status since 2012. Popular and unspoilt beach on the West Coast, roughly 50km north of Cape Town. Just off the R27, a further 13 km past Melkbos you will find a tidal pool, picnic and kids entertainment area, large parking and clean toilet blocks. This beach is popular with families especially from Melkbos and Atlantis. •	Granger Bay Yacht Club was award blue flag status for its beautiful marina for the first time in 2012. 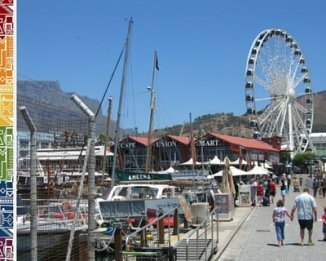 •	V&A Waterfront Marina had been award blue flag status in 2018 for its well-maintained marina. A bit more background: What are Blue Flag Beaches? The independent eco organization "Foundation for Environmental Education" (FEE) which was founded in 2001 in Denmark, is behind the "blue flag" initiative. The beaches in the Blue Flag Program are monitored regularly if they comply with the rules and are committed to uphold their status. The criteria for achieving blue flag status contain and judge not only the water quality at the beaches, but also the cleanliness, safety, eco management, services and facilities, environmental education activities and amenities at these beaches. South Africa was the first country outside of Europe who took part in the program and the first to get Blue Flag Awards for its great beaches outside of Europe. In 2019, the foundation is representing 44 countries and was awarding blue flags to over 4,500 beaches and marinas across the world. The Blue Flag movement started in 1985 in France and reached European level in the European Year of the Environment in 1987. Then in 2001 it reached global level, when South Africa joined the program too. South Africa has in 2019 more than 70 blue flag beaches and marinas. Popular Big Bay beach in Blouberg is still waiting for its official recognition as one of the best beaches in and around Cape Town. Let's hope for the near future, when the beaches will be checked again in the next annual review program, that this beautiful beach and the lovely promenade will be rewarded. 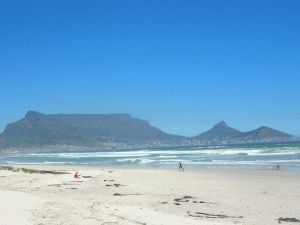 This beach is situated north of Cape Town and belongs to the suburb of Blouberg. There is a big lifesavers' club and the beach is especially popular with surfers.The beach is wide and long and invites walkers, families with kids and swimmers alike. However, make sure you don a wetsuit as the Atlantic is freezing up here but the waves are great! Read more. Cape Town has many fantastic beaches like the ones mentioned above, the water quality is usually good, but the facilities and services at the beaches are not everywhere like the high standard required to get Blue Flag status. As one of the main criteria is to have essential facilities not all beaches qualify, as many are small coves without toilet facilities or cover an area too wide to provide lifeguard services. Expat Cape Town Advice: Be careful when swimming at beaches without lifeguards, as in many places there are strong undercurrents. With Blue Flag Award or without, the beaches on the Cape peninsula are really worth a visit. To help you with your decision where to start exploring I have choosen three of them as the favorite Cape Town beaches with Capetonians and expats living in Cape Town. Which ones are these? Read more about our favorite CapeTown beaches. Looking for a sheltered windfree beach? Read my info here.